Here is the podcast of the sermon I preached last Sunday, March 30, 2008, titled Genuine Faith. The text is 1 Peter 1:3-9. The reading of the scripture passage is not included in this edited version, so you might want to read it for yourself first. Hope you find this message on the importance of the resurrection helpful. I developed a 50-week schedule to move from Genesis thru Revelation in 2008. I hand out a simple outline of the book(s) covered that evening. A key verse is identified which characterizes the book. We look for the overall “story” a book is telling, rather than the details. Since we announced this Thru the Bible in 2008 study, our attendance and enthusiasm on Wednesday nights has increased. Of course, a study like this only hits the highest-of-the-high points, so you have to lower your expectations on covering detail. But, covering a book a week in less than 45-minutes is an exciting way to get a 30,000-foot view of the Bible. Have you ever done anything like this, and if so, what did you experience? 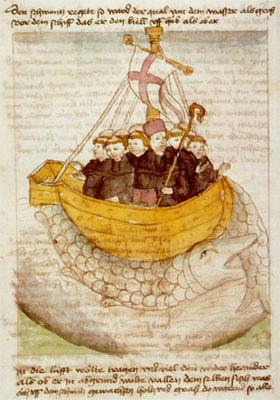 In his delightful book Sun Dancing, Geoffrey Moorhouse tells the story of the three men who set out in a tiny boat without oars or sails — for they wanted to be on pilgrimage for the “love of God.” This pilgrimage, called peregrinatio, was a pilgrimage of the heart expressed in a real journey. Peregrinatio was the desert in the ocean, as one author describes it. It was the journey without direction or guidance, except from the Spirit of God. If you had asked me almost four years ago, before I came to Chatham — Where will you take the church? I would have had an answer for you. Now, however, I see things differently. Planning can certainly be helpful, don’t get me wrong. But, some things cannot be planned. They unfold. They appear on the horizon. They arise out of nothing but the presence of God, and offer themselves as divine serendipities to those with eyes to see. We are adrift in our church right now, but we are not aimlessly adrift. We are seeking to find the “current of God” where the Spirit of God is flowing. We want to be there when the swelling tide of which hymn writers spoke carries us to the next place with God. So, like the ancient Celtic Christian pilgrims, we are on a journey for the love of God. We do not know the destination, nor do we seek to discern it as we pass landmarks on the way. We only know that we are seeking to travel with the same God who led Israel with a cloud by day and fire by night. The journey and the destination are one, for we are traveling with God. Isn’t that the goal of our lives after all? Here’s the sermon I’m preaching this Easter from Acts 10:34-43, another lectionary reading for this Easter Sunday. I hope your Easter celebration is glorious! He is risen! I’ll Be Glad When You Have Children of Your Own! Little did I know that one day I would have children of my own, and I would indeed understand. Or, at least remember that she had wished that moment on me — the moment that you hear your mother’s voice in your head and you know that she saw this coming long ago, and it is sweet vindication of all your parents ever suffered for you. And, you do understand. Because you’ve had an experience, you’ve grown, you’re wiser, you’ve been changed. That brings us to our text today, right out of the book of Acts, the book of the history of the early church. Luke, the same guy who wrote the Gospel of Luke, writes the book of Acts with the same kind of insight and precision we found in his gospel account. The Acts of the Apostles, as it is properly called, is the continuation of the story of those early followers of Christ. The setting for this text is not that first Easter Sunday morning when Peter ran to the tomb and was dumbstruck because it was empty. No, we are a few years past that first Easter Sunday, past the empty tomb, past the almost dozen appearances of the risen Christ to Peter and the disciples. We are past the momentous day of Pentecost, 50-days after Passover, when the Holy Spirit fills Peter and speaks through him and every person present hears the gospel in their own language, and 3,000 of them are saved and baptized. We are now in the early days of the infant church — struggling, persecuted, misunderstood, yet powerful. Peter takes center stage by force of his personality possibly, but more surely by the power of the Spirit in and on his life. He heals people, he raises a child from death, he stands up to the religious and political leaders — all the things that Jesus did, Peter now does himself in demonstration of the continuing power of the Kingdom which Jesus announced and inaugurated. And, still Peter is a Jew, a devout practicing Jew, as are most of the Christians at that point. Then, one night Peter has a dream. In the dream, a great sheet is let down from heaven, and on that sheet are every kind of animal. Then, as Peter is looking at all the animals, a voice says, “Get up, Peter. Kill and eat.” In other words, you can eat any of these animals before you. Now, based on Peter’s answer — “You’ve got to be kidding!” (Actually, “Surely not, Lord!”) — Peter thinks he is passing the dietary law test with flying colors. After all, what is Jewish culture noted for if not its dietary laws? We westerners have even picked up on the seriousness with which Jews take culinary restrictions when we exclaim, “That’s not Kosher!” to protest something that doesn’t seem right. Peter was kosher, if anybody was. But, the Voice says something strange, “Do not call anything impure that God has made clean.” And, as if to make the point, this happens three times — a sheet full of animals, the command for Peter to eat, and again, and one more time. Now, while Peter ponders what this means, unknown to Peter, Cornelius, a Roman centurion, has also had a dream. Cornelius is a God-fearer, but not a Jew. Jews of the first century looked down on two groups of people — Roman soldiers, and everybody who wasn’t a Jew. Cornelius was both. But Cornelius was a devout man, and in his dream an angel of God, not just a voice, appears to him. The angel tells him his gifts to the poor and his prayers have come before God as a memorial offering. Because of that, the angel tells Cornelius to send for Peter, who is staying at Simon the Tanner’s house in Joppa. When Debbie and I made our last trip to China together, we had dinner one night with about a dozen Chinese men and women, most of whom we did not know, and most of whom did not speak English. Our manager, Mr. Lin, explained who everyone was, and pointed out one man in particular. “He is Chinese CIA,” Lin explained, “Very important government man.” So, we all spent the next hour smiling, and nodding, and eating. With the Chinese military intelligence man. Or spy, or whatever he was. I really didn’t think much more about him, because Chinese men in Shanghai have a tendency to inflate their resumes, so I really didn’t know if this guy was a military intelligence officer or not. But, when the time came for us to go back to the airport, Lin said, “Mr. Military Intelligence will send a car and soldier tomorrow to drive you to the airport.” Now, we had already tried to take pictures of some Chinese soldiers when we visited a Buddhist shrine, and were warned that was not a good idea. So, we didn’t know what to expect. But, sure enough, the next morning, a white minivan, with a fully uniformed, but unarmed, Chinese soldier arrived at the Holiday Inn Crowne Plaza to pick us up and take us to the airport, which was about an hour-and-a-half ride. Lin waved to us as we rode off into the sunrise, Debbie and I thinking we might never be heard from again. So, I can imagine how Peter must have felt when a Roman soldier shows up to take him to a Roman centurion named Cornelius. Nevertheless, with the Spirit’s assurances, Peter goes, arrives at Cornelius’ home, and Cornelius falls at Peter’s feet, tells him about his dream, and then Peter understands what his own dream meant: God’s people now included people other than Jews. Then, Peter begins to speak, “I now realize how true it is that God does not show favoritism, but accepts men from every nation who fear him and do what is right.” Of course, we agree with that statement, but it’s hard for us to comprehend what a big leap this is for Peter. Peter is a Jew. The Messiah was promised to the Jews. The Promised Land was given to the Jews. God’s covenant was with the Jews. The Jews were God’s chosen people. Not the Gentiles, and certainly not a Roman centurion, his servants and friends. But, Peter now understands. And he understands because God wanted him to understand. God sent the dream to Peter, and to Cornelius at the same time. God had Cornelius’ men arrive just as Peter is pondering his own dream. God wanted Peter to understand because the next step in redeeming the world is to include more people than just Jews. 36 You know the message God sent to the people of Israel, telling the good news of peace through Jesus Christ, who is Lord of all. 37 You know what has happened throughout Judea, beginning in Galilee after the baptism that John preached— 38 how God anointed Jesus of Nazareth with the Holy Spirit and power, and how he went around doing good and healing all who were under the power of the devil, because God was with him. Peter tells Cornelius, “You’ve heard the message God sent to the people of Israel, the message of Jesus who is Lord of all.” This message is no longer just for the Jews, it’s for everybody. The events happened in Israel, but Jesus is Lord of all. And, if that’s not enough, Peter says, “We’re witnesses of everything he did in the country of the Jews and Jerusalem.” The events of Jesus life and ministry happened there, Peter is saying, but they’re good other places, too. And, Peter goes on that after they killed Jesus, God raised him from the dead and caused him to be seen. Not by everybody, but by us, Peter says. We even ate and drank with him after he rose from the dead. And, Jesus himself commanded us to preach to people and say that he is the one whom God has appointed judge of the living and the dead. Oh, and by the way, all the prophets say that everyone who believes in him receives forgiveness of sins. Everyone. Not just the Jews. Everyone. 44While Peter was still speaking these words, the Holy Spirit came on all who heard the message. 45The circumcised believers who had come with Peter were astonished that the gift of the Holy Spirit had been poured out even on the Gentiles. 46For they heard them speaking in tongues[a] and praising God. Then Peter said, 47“Can anyone keep these people from being baptized with water? They have received the Holy Spirit just as we have.” 48So he ordered that they be baptized in the name of Jesus Christ. Then they asked Peter to stay with them for a few days. Cornelius and his friends are so moved, so open, that the Holy Spirit comes upon them. They speak in tongues as Peter and the apostles did on Pentecost, and they praise God. The Jews with Peter (the circumcised believers) were astonished because these Gentiles were having the same experiences the Jews had — the Spirit was at work in their lives, too. I like Peter’s reply — “Can anyone keep these people from being baptized with water?” They had already been baptized with the Spirit, so now everyone there understood. God really was the God of the Gentiles, too. Into the first century world of power politics, racial division, and ethnic hatred, Jesus came with resurrection power. Some followed him, but they still didn’t understand. Peter was among those, those who wanted to follow Jesus, those who wanted a different world than the world they lived in, those who wanted to know God. But, Peter didn’t understand. Peter didn’t understand what Jesus was doing when he fed the five thousand. Peter didn’t understand what Jesus did when he spoke calm to the raging storm. Peter didn’t understand how Jesus could tell them where to cast their nets, and then he didn’t understand how they could catch so many fish in the blink of an eye when they had been fishing without any luck all night. Peter didn’t understand when Jesus was arrested, and even though he tried to stay close, Peter denied Jesus. All because he didn’t understand. Peter didn’t even understand when he ran to the empty tomb that Easter morning. Or when he saw the risen Christ, not once but maybe 11 times. He didn’t understand after Jesus’ ascension, as he and the other apostles waited in a room in Jerusalem because they were afraid for their lives. But, on the day of Pentecost, when the breath of the Holy Spirit breathed into Peter so that he stood to preach a sermon like no one had ever heard, Peter understood. When tongues of fire appeared on their heads, and the sound of rushing wind filled the place, Peter understood. When 3,000 came to Christ that one day alone, Peter understood. And, when a beggar asked for money, Peter and John could say, “Silver and gold have I none, but what I have I give you. In the name of Jesus Christ of Nazareth, walk.” And the man lame from birth not only walked, but he jumped up and walked, following them into the Temple and praising God. Peter understood that the apostles were now carrying on the work of Jesus — healing the sick, raising the dead, challenging the religious leaders, suffering persecution, gathering the flock. All because his experience changed him. Now I wish I could tell you that’s the end of the story. That Peter finally understood, and lived in the light of that understanding for the rest of his life. But, not long after that Paul has to confront Peter. Peter eats with the Gentiles when there are no Jews present, but when a delegation comes from the First Baptist Church of Jerusalem, Peter quits eating with the Gentiles for fear of offending the Jews. Peter’s memory is short, and though his experience changed him, his cultural bias betrays him. We can say we understand because we had an experience. We can say that a break-through came in our lives when God taught us something, or circumstances arrayed themselves in a providential manner so that we had new insight into what God was doing. And we can live that way for a while. But one day, we’ll slip back into old patterns if we’re not careful. One day we’ll forget the glow of that life-changing experience. One day we’ll find ourselves like Moses — still wearing the veil to cover our faces but without the glory of God on our faces. And, that’s where Easter comes in. Because we need to come back from the culture of death that still tries to pull us down. Peter said of Jesus, “They killed him, but God raised him up.” In that resurrection is everything we need to live. Because the resurrection of Jesus is the guarantee that the resurrection is coming one day for us, too. That resurrection of Jesus is the assurance that the tentacles of death — despair, hopelessness, faithlessness, inconsistency, failure, and sin — that they are powerless to take and to hold us. In the resurrection are the miracles of Jesus, the power of Pentecost, the hope for the future, the gates of heaven, the defeat of death, the end of fear, and the promise of tomorrow. We celebrate Easter as though it happened once, long ago. And it did, but it happens each day, each moment, when someone moves from the Kingdom of darkness into the Kingdom of light. When someone dreams a dream that draws them closer to God, when someone hears the Spirit spur them on to a new walk with God. This is the sermon I preached last year at Easter. However, John 20:1-18 is the Gospel lectionary reading for this year, so here’s the manuscript of that message. The video and audio versions are also available. I’ll post my Easter sermon for this year tomorrow. 10Then the disciples went back to their homes, 11but Mary stood outside the tomb crying. As she wept, she bent over to look into the tomb 12and saw two angels in white, seated where Jesus’ body had been, one at the head and the other at the foot. “They have taken my Lord away,” she said, “and I don’t know where they have put him.” 14At this, she turned around and saw Jesus standing there, but she did not realize that it was Jesus. 18Mary Magdalene went to the disciples with the news: “I have seen the Lord!” And she told them that he had said these things to her. The events of the past week were a blur for Mary Magdalene. Only a week ago, she and dozens of Jesus’ followers celebrated his entry into Jerusalem with an impromptu parade. Mary Magdalene remembered how the shopkeepers and pilgrims, in Jerusalem for the Passover celebration, had stopped to look, then joined in the procession that had moved joyously down the crowded Jerusalem streets. The days that followed were a confusing mixture of preparation for the Passover, and watching Jesus do things he had never done before. Like giving strange answers to the chief priest and the Pharisees who challenged Jesus as he taught in the temple. Watching Jesus create a small riot as he chased the temple money-changers out of the court of the Gentiles, creating quite a scene. Then, of course, Mary Magdalene had heard about that Thursday evening. She wasn’t there, but she had heard the story repeated over and over. A meal around the table with Jesus and those closest to him. Jesus, saying things about the meal that he had never said before. Like “this bread is my body broken for you” and “this cup is the new covenant in my blood” – only later would she understand. Later, after Jesus had been arrested and word had come from breathless men, excited and shaking with fear. Men who had vowed to fight the Roman legions, men who had promised to stay with Jesus no matter what happened. The same men who had run away when the chief priest had Jesus arrested. Mary didn’t know who was more pitiful. Those who had run under the cover of darkness, forsaking Jesus, or Peter who had followed Jesus. At least he did that, but who then denied not once, but three times that he even knew Jesus, much less was a student, a disciple of that Galilean. All were heartbroken. All were shaking, weeping, pounding their chests and foreheads with their fists, inconsolable for having left their friend, Jesus, in the custody of the chief priest’s henchmen. But then it got worse. As day had broken over Jerusalem, word quickly spread that Pilate was releasing Barabbas. Barabbas was a terrorist, a murderer, an insurrectionist. If Barabbas was being released, something dreadful was happening. Waiting in the streets of Jerusalem, Mary and the others milled around, trying to catch a glimpse of Jesus, or hear what had happened to him. Pilate will have him whipped and then release him, they told one another. That’s what he usually does when he’s trying to placate the Jewish leaders. A little dose of Roman justice, but not too much, just to keep the Jews happy. She saw a figure, hunched under the weight of a Roman cross, blood streaming down the cuts on his back, blood dripping into his eyes from some sort of thorny crown that was pushed into to his forehead. The horror of that scene was enough and Mary began to divert her eyes. As she did, she saw something familiar. A profile she had seen before, disfigured to be sure, but familiar. And then she realized – this man, this poor man was Jesus. She watched him struggle with the cross, stumbling, falling in the dirt, rising each time under the weight of a beam too heavy for him to bear. The Roman centurions were tiring of this game, it was taking too long to move this procession-of-the-damned down the street and out of the city. So they grabbed a stranger, ordered him to carry the cross of Jesus, and the macabre parade resumed its march of madness. The disciples followed, all too aware of how this would end. Once the verdict of death had been pronounced by a Roman authority, there was no reprieve, no second chance, no appeal. All they could do now was follow the cross in horror, weeping as they walked. The scene at the Place of the Skull was even worse. Two other men were being hoisted up, nailed to crosses, their crimes placarded above their heads. This was Roman justice, this was capital punishment at its cruelest, and most heinous. Mary could not watch as Jesus was thrown to the ground, Roman soldier on each side, grabbing a leg and an arm, and pulling Jesus into position on top of the cross. Mary heard the sound of the nails being driven through the hands and feet of Jesus. The hands that had touched her and released the power of darkness from her body. The feet she had washed, now bruised and bloodied beyond recognition. The jarring thump of the cross dropping into its resting place, and the agonized cry of Jesus, caused her to turn and face him. Huddled with the others who loved him, all they could do was weep. Weep for the gentle man who had been their friend, weep for the ache in their hearts, weep because nothing else could be done. Jesus cried out, the soldiers tried to push a foul mixture of soured vinegar and gall in his face, but Jesus turned his head. Time seemed to stand still, Mary felt as if she were in a scene from hell, but it was real. Someone screamed, “Jesus said the stones would cry out!” It was as if all of creation were groaning, struggling with the death of the Creator, uncertain what to do. So the sun quit shining, the ground quaked, the sky were darkened, as if the world knew something no one else knew. Slipping and sliding down the hillside as they, too, ran for safety, Mary glanced back and saw the lifeless form of Jesus, being ripped from the cross by the soldiers. Thrown on a makeshift stretcher without care, the lifeless body of Jesus was born down the other side of the hill, out of sight. Word came that Nicodemus, kind, curious Nicodemus, and a man named Joseph had asked Pilate for the body of Jesus. Joseph had laid Jesus in his own grave, a tomb cut out of the rock. But now it was too late to go, the Sabbath was coming. So Mary and the others stumbled back to a room someone had found, where they huddled together. The Passover went on, in homes and dining halls around Jerusalem that night, the question was asked by the youngest in each household, “Why is this night different from all others?” And then the family told the story of how God had brought the nation of Israel out of Egypt, out of slavery, out of darkness into the light of God’s promise. But for the disciples, the Passover was meaningless. The evening passed for them, not in remembering the exodus, but in remembering their friend. It was too soon to tell stories about Jesus – too soon to laugh at the times they had shared together, too soon to recall the amazing things that Jesus had done and taught them. So they wept, and when they were worn out with weeping they sat, eyes burning with tears, in exhausted silence. The women there began to talk about what must be done. Jesus body had only had a hasty entombment, without proper ceremonial care. So the women would go to the tomb. They left that morning, several of them together, for strength as much as anything, making their way through the darkness of night to the tomb. They were determined to be there when the first beams of sunlight broke the darkness, ending the Sabbath. Jesus would wait no longer than absolutely necessary for a loving and proper preparation. Arriving at the tomb, the scene was amazing. The stone was rolled away, the grave cloths were in place, but there was no body. The women hurried, running at times, back to the disciples, back to the room where the men huddled. In their excitement, broken sentences, gestures, and tears told of more tragedy — Jesus body was gone. Peter and John had to see for themselves. They ran, John fastest and most eager, Peter close behind. John, stopped at the opening to the tomb, peering into the darkness. Peter brushed by him, and ducking, shouldered his way into the tomb. The women were right, there was no body. John also looked, and believed that the body was gone. The two of them ran back to tell the others. Mary Magdalene stayed behind, weeping again. Then she turned and saw another figure, a man, not an angel. “Maybe he’s the gardener, he’ll know,” Mary thought. Instantly Mary knew that voice, that gentle voice. That voice had greeter her many times, that voice had commanded demons to leave her and never return, that voice had blessed broken bread in their homes, that voice had calmed swirling seas. That voice belonged to Jesus. “Rabboni,” Mary exclaimed. Grabbing him, holding him, weeping for joy this time. He is alive and he is here. Glancing back over her shoulder, Mary Magdelene runs toward the city, with the news, “I have seen the Lord.” She had seen Jesus, again — for the first time. I’m still working on the sermon for Easter Sunday, but here’s the sermon I preached last Easter titled, “Seeing Jesus Again for the First Time.” The text is John 20:1-18. The manuscript is here, and here’s the audio mp3 and the video. Sunday’s coming!